Posted by quriouscat in Travel Log. The last week of school in Gorizia was a whirlwind. Finishing a documentary in three weeks was extremely difficult, but I am better from the experience. While everyone was rushing to finish their films, it was hard to see that we only had a few more days with one another in Gorizia. Our impending departure did not hit me until I started packing my bags and imagining when I would come to this part of Italy again. After I packed all of my bags to set out for Venice, I headed down stairs for my last delicious breakfast in the hotel lobby. To my surprise, my fellow classmate, Brendon, was on his computer at the far end of the dining hall. He looked a bit stressed, and it turns out he had no place to stay the night before his flight. My mother knew there would be a night I would have to spend alone in Italy before my flight, so she had booked in advanced a place for me to stay. The room had two beds, so I invited Brendon to come to Venezia with me, saving him money, and giving both of us a great travelling buddy! After the 3 hour train ride to Mestre, we hauled a taxi to take us to our hotel close to the airport. After settling into our surprisingly fancy digs at the Best Western, we headed on foot towards the station to catch a train to Venice. 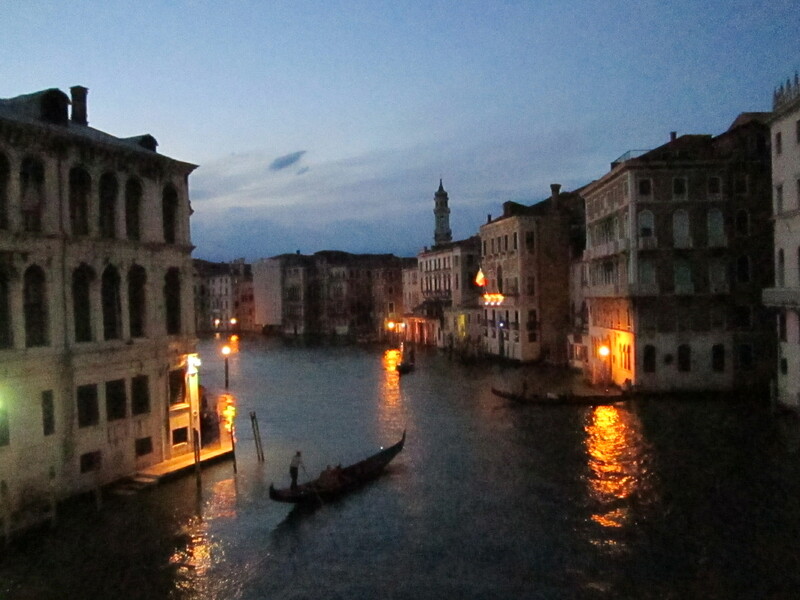 The window on the train to Venice looks as if you are gliding right over the water. It is quite magical to get out of the train station on the island and see a plethora of color, music, voices from the street, buildings, and of course, water. 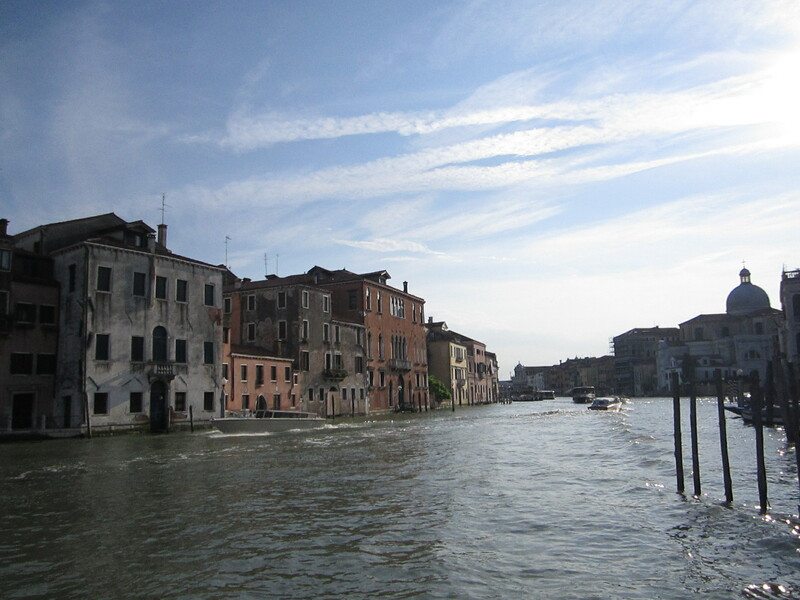 The main roads of Venice are water. 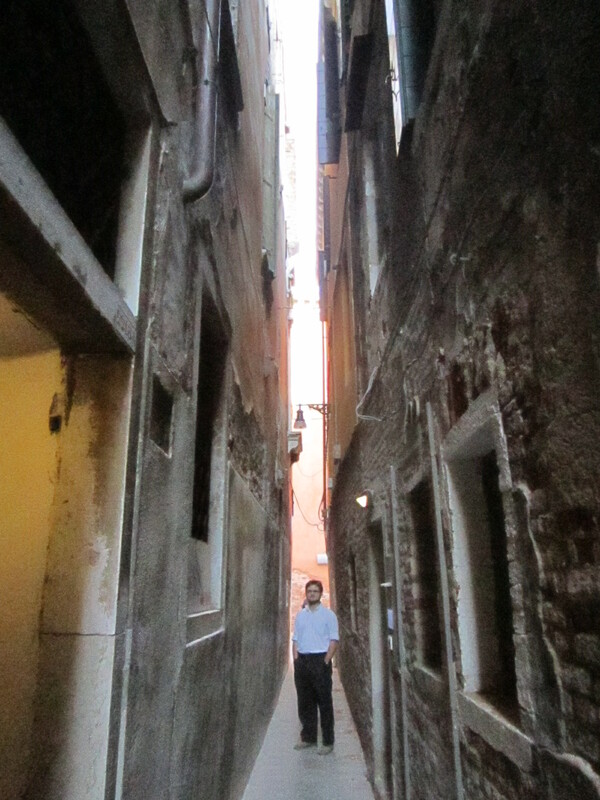 I am still amazed to think of how skilled the navigators of Venice were to manage such tight turns and tiny canals. Even on foot, it seemed as if one had to have a keen sense of depth and direction to make it through the “streets” of Italy’s most beautiful city. After a quick dinner, we continued exploring Venice. It is a very adventurous town because you can only get so lost on an island that small. And, if you were to get lost, you got just hop on a bus (a WATER bus) and it will eventually lead you back to square one, the train station! 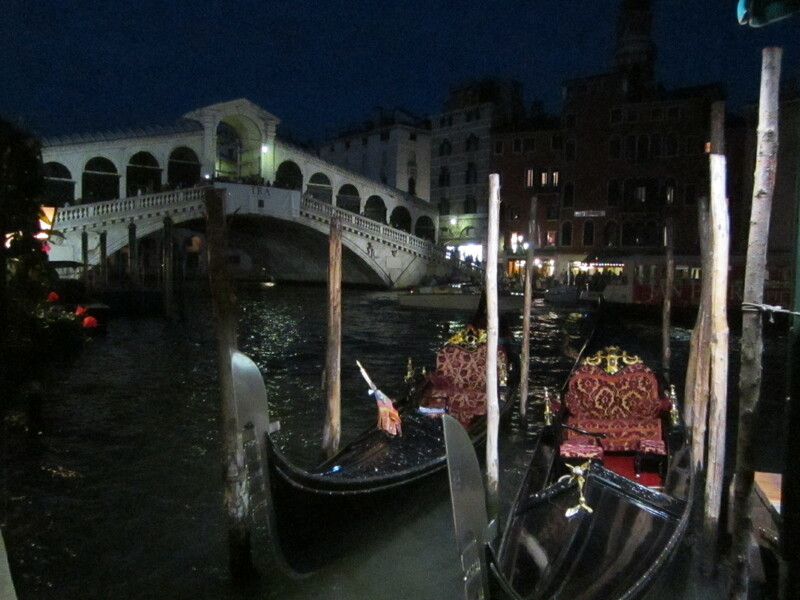 As the evening came to a close, Brendon and I stumbled upon the Rialto Bridge, spanning over the Grand Canal. The lighting was perfect for pictures as the streets started to light up with the hustle and bustle of cafe’s, clubs and lovers. I took so many good photos while the sun dimmed under the waters of Venice, but none could truly capture the energy of this city. The sounds that filled the air of the great place as Brendon and I watched the boats go by on the square, could never be replicated. It was a great end to a wonderful month, and I can’t wait to visit Italia again. Viva Italia! After a long week of filming and assignments in Gorizia, it was time for another weekend excursion. After planning for about a week and a half, it was finally time to head to Pula, Croatia! I managed to raise enough interest for the trip to accumulate a large travel group of 8 students. Xavier, Casey, Rachel, Eric, Pablo, AJ, Clayton and I began our journey around 6:30AM. We first boarded a train from Gorizia Centrale to Trieste. 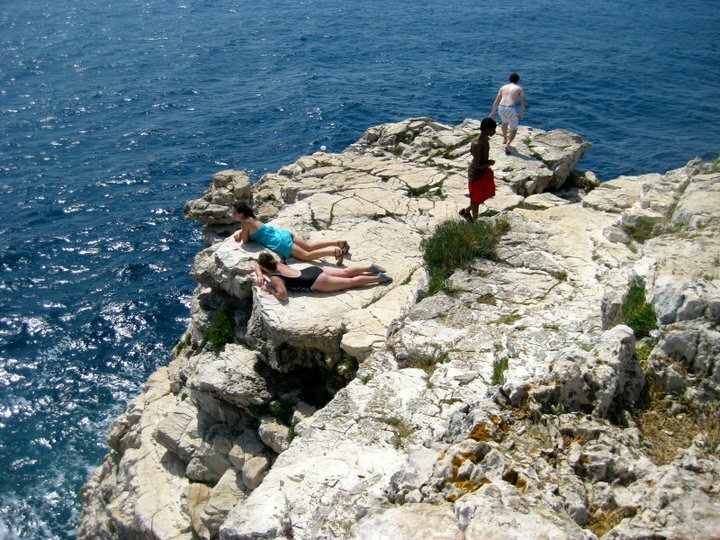 From there, we reserved eight spots on one of the two available buses that travel from Italy to Croatia during mid-June. The bus took about 4 hours to reach our destination, but was very cheap, and offered breathtaking views of the Slovenian and Croatian landscape (as well as a nifty passport stamp!). The wild European driving through the mountain roads offered a thrill as we passed through every town (big or small) on the Istrian Peninsula. We arrived at Most Hostel (just outside of the downtown Pula area) at 2:30PM. Our lovely hostess, Gordana, greeted us with open arms, and began telling us all of the places we should visit during our stay. She had extra beach materials (including a snorkel) and we grabbed some gear before heading to lunch. Gordana suggested a delicious and cheap place with a traditional dish, Cepavi. We headed down the street and found ourselves immersed in the smell of grilled beef and toasted bread. All of us couldn’t stop talking about how delicious our meals were, as well as the low cost. Cepavi, beer, and yogurt cost me around 6 USD. The taste and experience was priceless. Soon after, we shopped for souvenirs in the shops around our hostel. After shopping we hopped on a bus to the beach. Gordana directed us to Ambrella beach, where the locals go for a swim. The water was clean and clear, and schools of fish swam right underneath you! 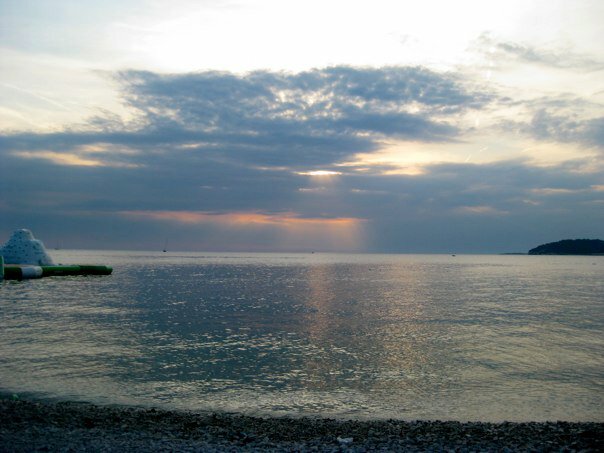 The Adriatic is so salty, it takes no effort to float and watch the clouds above you. We stayed for the sunset, skipping stones, playing at the water park, and eating 5 Kuna ice cream (less than 1 USD). After a night of rest, we all settled down for a simple breakfast. We purchased fresh milk, jam and bread, and it was almost as good as the Cepavi we had for lunch the previous afternoon. After suiting up we headed back to Ambrella beach to, swim, relax, sun bathe and explore all day. I discovered an amazing cliff while exploring and quickly gathered the group to check it out. I think discovering that part of Pula is what convinced me that Croatia is home to the best beaches I have ever experienced! We returned around 6:30 pm, showered and headed out for another round of Cepavi. The cliffs we trailblazed! It was breathtaking and beautifully blue! The next day, we headed back to Trieste via bus in the late afternoon. The remainder of our time was spent in the open air market, eating gelato, fresh fruits, and buying some cheaply priced souvenirs. I encourage everyone who visits Europe to visit Croatia. Though the prices are cheap, the experience is priceless, and you will create some memories you will never forget. At the end of my second week in Gorizia, I was not sure if I had enough energy to travel. School was getting busier, especially in my Documentary Filmmaking class. After churning out the film’s topic (The Permanence of Ink), we became challenged by the details of the application into a cohesive piece. After gathering over seven hours of footage, things came a bit clearer, and I felt a huge weight off of my shoulders as the weekend came around. 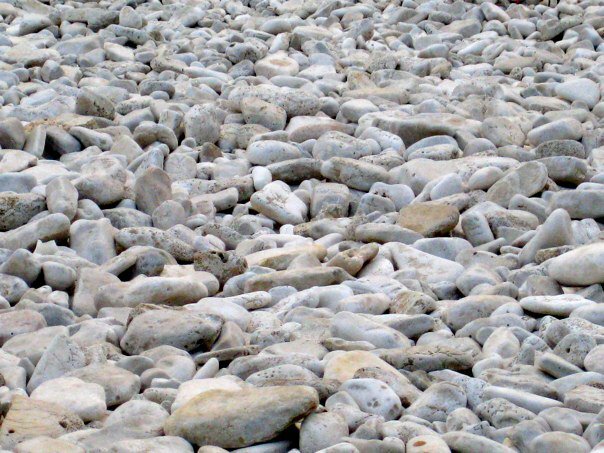 I knew a large group of my classmates were planning on visiting Florence this weekend, but I wasn’t sure what to see or do there. Luckily, my friend and documentary team-mate Nikita, had already made a loose itinerary of activities, and invited me to come with her in a small group (Nikita, Pablo and I) to the city of art. So I did. After getting lost in Gorizia on our way to the train station (it was my fault, but everyone was really nice about it), we were finally able to make it to our hostel in Florence around 3:30. We dropped our bags off at the hostel, freshened up a bit, and hit the city. On the way to the Nationalle Accademia (where Michelangelo’s “David” stands) we came across a slew of free markets with leather, scarfs, etc., as well as street performers literally drawing the great masterpieces of DaVinci on the streets. Also, we saw J-Wow and her boyfriend Rob walking down the main shopping street, holding hands while being filmed for the newest season of Jersey shore!!!!!!!!!! After stopping for pictures by the Piazza del Duomo, we made it to our destination: David. I am not going to attempt to describe it, because it is something everyone should go see. After carousing through the rest of the works in the museum, we headed to a nice restaurant called “ZaZa”. I ordered seafood spaghetti with a side of rosemary potatoes. Nikita – fresh Gnocchi in a truffle sauce. Pablo – Chicken Florentine (which just looked like incredibly delicious chicken tenders, served with lemons). It was the first nice, sit down restaurant I indulged in during my trip in Italia and I definitely will make sure to do the same in Croatia with traditional Croatian food! After eating, we stayed a while, and ended up talking to the people sitting in the table behind ours. They were Georgia natives! Their son had just graduated from highschool and was taking a nice vacation before starting school at UGA in the fall. I scowled at him (in true Tech tradition) but we ended up talking for a while. Soon enough, a 6 piece band started playing Italian music near our table. Their sound continued to fill the rest of the piazza as we meandered to our hostel, smiling at each other the entire way back. 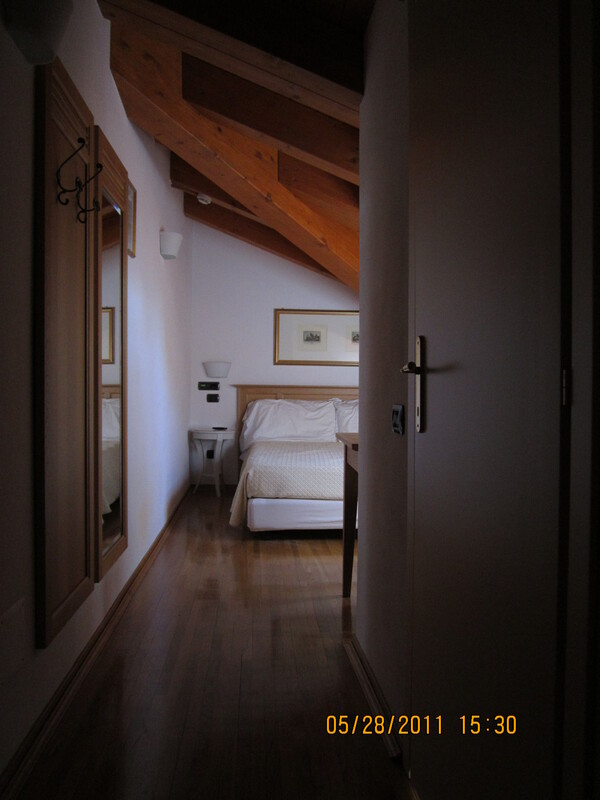 I headed to bed very early that night, so as to have full energy for the Duomo the next day. 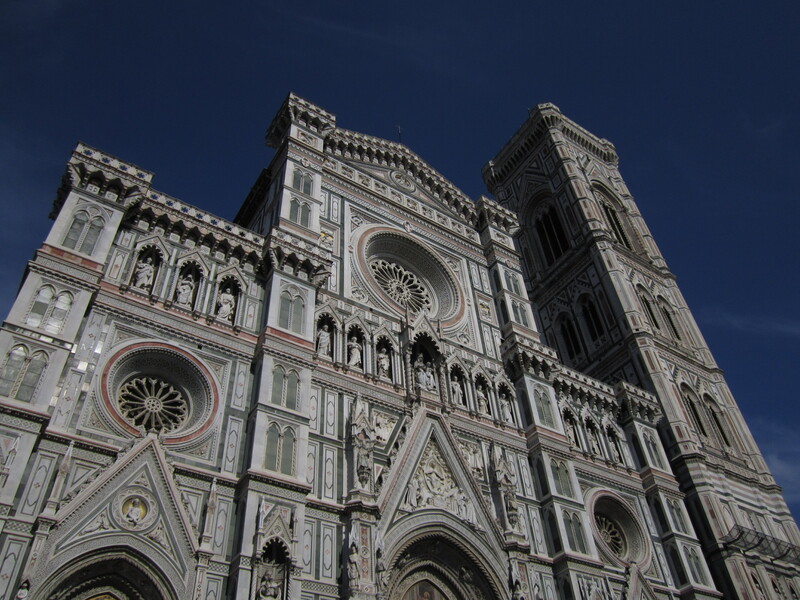 After making it through the long line inside, we marveled at the intricate flooring, and high ceilings of the Duomo, while asking each other what we thought various symbols meant within the colossal structure. I took about ten videos of the acoustics within the cathedral. The sound was tremendous! We then headed to the line to climb to the top of the Duomo. At the back of the line, I ran into a stranger I meet the previous afternoon. While I was waiting for Pablo and Nikita outside of the hostel, I saw a young man with a large backpack and pointed him towards our hostel. Outside of the Duomo, I invited him to join our group, and he became our 4th wheel the rest of the journey! The top of the Duomo was breath taking. Getting there was quite the adventure, and I am happy to say Dr. X at Emory hospital should be proud of his ACL replacement! It was quite a reward to reach the top of the historic cathedral, and a treat to take in the panoramic views of Florence and Tuscany. After leaving the Duomo, all four of us headed to the open market. Upon returning to the hostel, I cooked a big pasta lunch for everyone, including Arrabiatta sauce, Modena vinegar, and red pepper parmigiana. Spicy, but, delicious! So delicious that I had to siesta after consumption. I woke up around dinner time, and was offered Bolognese spaghetti, prepared by a French hostel guest, who just so happened to have had professional training as a chef. It was so yummy! And free! 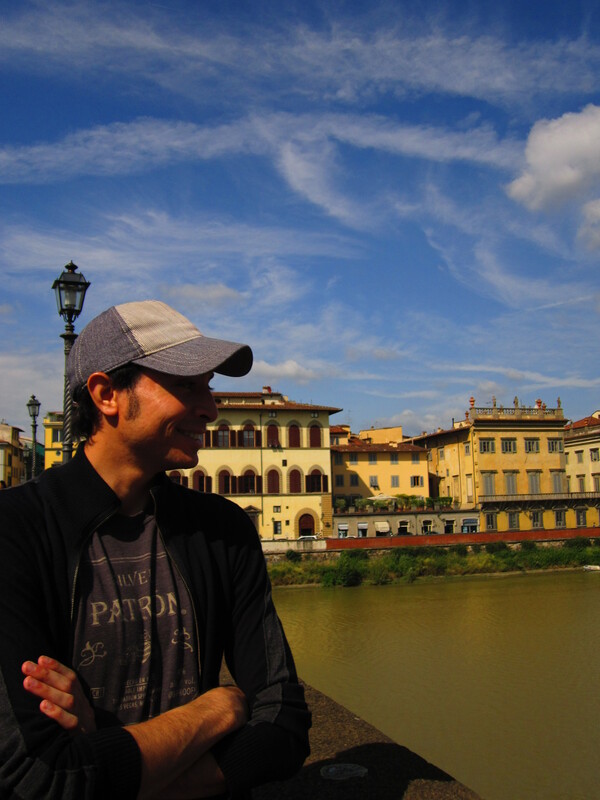 After checkout the next morning, Nikita, Rob and I caught an afternoon train to Pisa. We had just enough time to walk from the train station to the leaning tower, take a few pictures and head back to the train station. The excursion was worth the travel fare, but if I am ever in Pisa again, I would definitely go in the museum or climb the tower. The first two weeks in Gorizia have been amazing. I really have enjoyed getting to know my fellow students in IFS (Italian Film Studies), as well meeting friendly strangers every step of my path in Europe. Not to mention, the three day weekends have raised my status as an international traveler! The documentary topic my group has chosen for my film production class is very rich. “The Permanence of Ink” will follow the diverging and converging paths of ink in two different spaces: a tattoo parlor and a document restoration studio. There are a lot of different ways to approach the documentary, but I am confident our group can make something people will want to watch, and enjoy. Life outside of school has been indescribable. I had the most incredible weekend with my lovely sister! There was a Catholic holiday our first weekend, so I was able to take off for Belgium after classes ended on Wednesday. I met up with my sister at Antwerpen Centraal 9:30 Thursday morning, and spent the day wandering around the city, making silly videos, and catching up. We stayed with one of her Belgian friends, Koen-a great host! After wandering around the city, he took us to the river side to watch the sunset. The weather was perfect, as well as the view. The second day, my sister and I headed out via rail to Brugges (just north of Antwerp). The city’s layout was a bit hard for us to navigate, but my sister and I managed to wrangle some segways and tour the city with a guide, after a very quick stop at the fry museum! IT WAS SO MUCH FUN! I highly recommend this method of transportation, in any place, at anytime. Segway road trip, anyone? We made it back to Antwerp in time to catch the Belgium – Turkey soccer game with Koen. It game ended up in a tie, but that night with Raleigh and Koen was the most fun I’ve had so far in Europe! The next day I explored Bruxelles by myself before flying out the next day. It was a beautiful city, and did some souvenir shopping in the Grand Place. I liked my time in Brussels, but I was already missing my sister and my new friend! I guess it’s the life I must adjust to as a jet setter…. 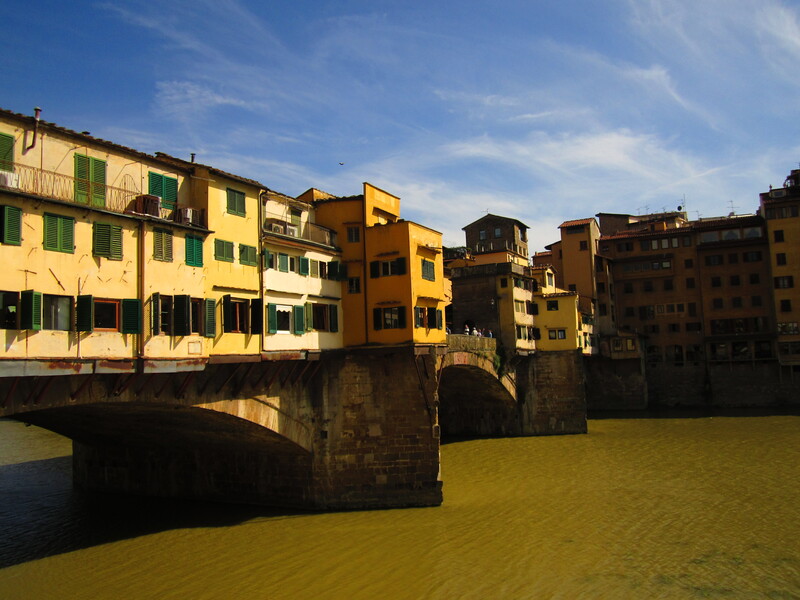 Speaking of jet setting, I’m heading to Florence tomorrow. I don’t really know what to expect, but I kind of don’t want to do much research on the city. I guess I’m just expecting to be surprised. I have arrived in Gorizia! It took a plane, a train, a bus, a taxi and a very helpful lady on the train to get here, but I made it! I put my bags down in my hotel just in time to miss dinner (about 8:45 pm here). My friend missed a flight to connect to the flights to get him to Italy, so we were on the plane together from Roma to Venezia. However, his bags were lost in the process. I have promised myself I will never take US Air thanks to his experience. I waited with him in the line to speak to the airline people (about an hour and 15 minutes after I got my bags). I left Venice at 4pm via bus to Mestre rail station. I bought my ticket to Trieste. Thank God I didn’t catch the memo that there was a faster train to Trieste leaving 6 minutes after mine! I would have missed my stop Gorizia. I was about to get off at Udine, but I asked the lady sitting behind me what I should do to get to Gorizia (the ticket man told me I should have waited for the other train to get to Trieste). Turns out, she was getting off at the same stop 🙂 We chatted about 25 minutes until our train stopped. She insisted to call a taxi for me. We departed outside of the train station, and I thanked her for all of her help. The whole exchange was truly magical. She was returning to Gorizia to visit her father in the hospital, and having a hard time. The woman works restoring old architecture in Tuscany and had spent the day travelling on train, worrying about her sick father. She told me that in Italia, “there is what we call, diversity” (she could barely speak English, but we managed to have a very deep conversation). Even though she was having a very sad, hard day, she was truly happy to meet me, and that helping me really made her feel energized and optimistic about returning to Gorizia. In return, I was able to make it to the Hotel comfortably, without any confusion. I arrived just ten minutes too late to eat the hotel dinner last night. That was ok though because there is a tiny festival going on in the square just outside of our Hotel corner. I ate a Slovenian sandwhich with fritas and drank a coffee at the coffee bar steps away. I plan on working on my Italian a lot, because no one here speaks Deutsch! I have met one German speaking person on my entire trip so far, and one older Lebanese couple in the Rome airport that I was able to hold a mixed French conversation. I met the German speaking man at the coffee shop. He is a policeman/baristo. His name is Max, and he helps his wife take care of her cafe bar (coffee bar) about 20 feet away from Hotel Entourage when he isn’t working. We had a great conversation over machiatto with another coworker-Erica. I met the cafe owner Manuela and Erica and I talked about an hour about how she is opening a library in town the next couple of weeks. I think that may be a good subject for our documentary. My new friends at the Cafe told me to come back whenever to chat! I’ve already made friends with a few of the locals, and I’m starting to get to know my classmates. This will be an amazing trip. Attached are some pics of my amazing room and the amazing view! 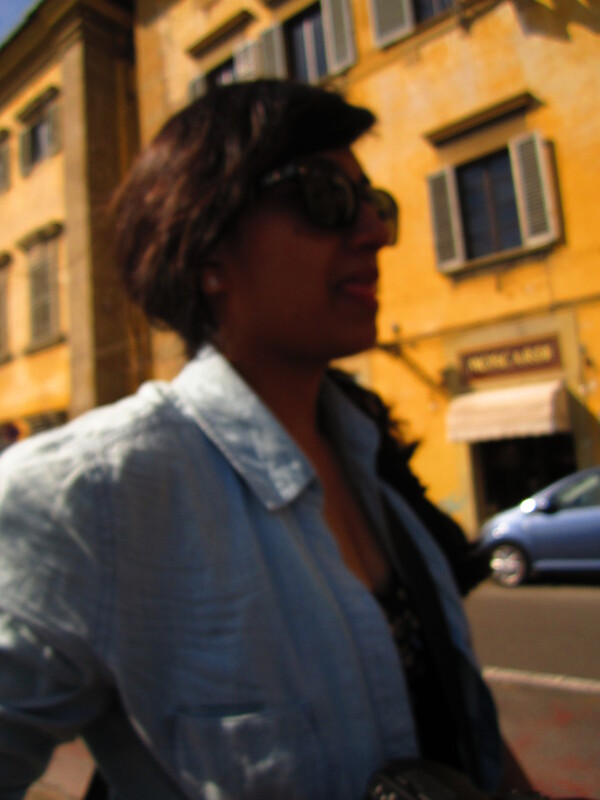 My First Week in Italia!